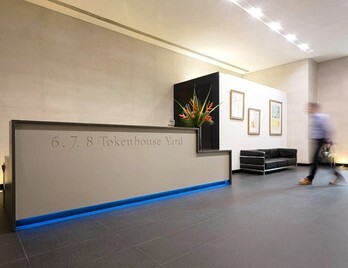 Bespoke reception desks may be necessary when there are certain factors have to be taken into consideration. These factors may include specific size requests, layouts, or the need to match wood finishes to the building materials. 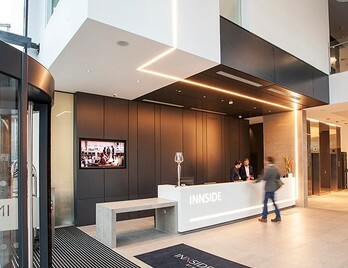 Sometimes, however creating a bespoke reception desk may be a case of wanting to create something memorable, incorporating an element of the organisations ‘story’ or culture. 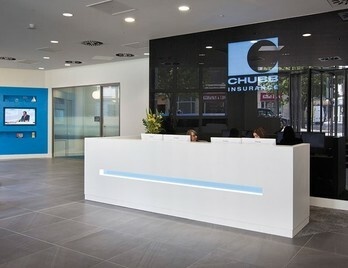 Take a look below at some examples of bespoke reception desks. 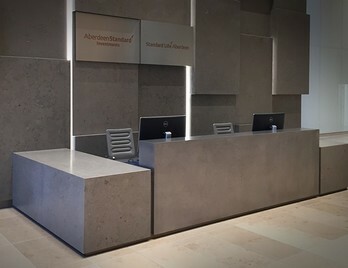 A bespoke reception desk is a secondary architectural element, having to blend with the interior landscape and immediately serving and supporting human interaction from both sides. 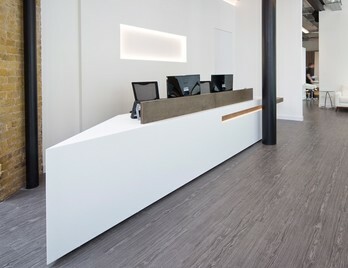 When considering a bespoke reception desk there are many factors to take into consideration. 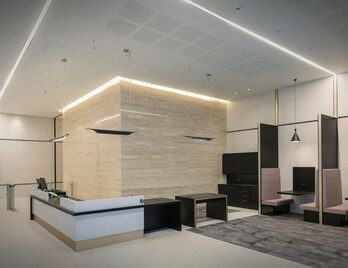 You may initially be concerned with the style and the look of the reception desk and it’s not uncommon to start thinking about the impression it will give the company or organisation. The aesthetic is obviously important but consideration should be given to the way the desk will be used and how it will function. 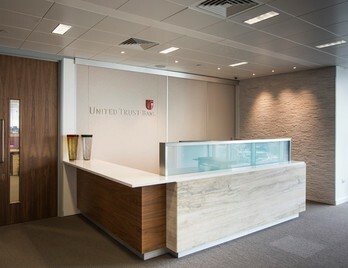 What main factors should I be considering for a bespoke reception desk? 1. How many people will be using the desk? 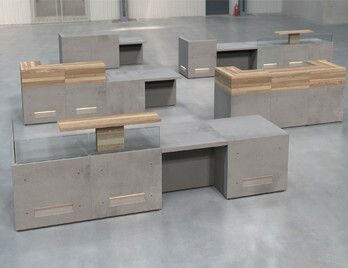 You may know this from the offset but it helps you decide on what shape the desk could take? Usually, a straight desk accommodates two people easily whereas with a curved desk you have to consider the chair reversing space behind each user as this space may be compromised. 2. What sort of IT equipment will be supported by the desk? 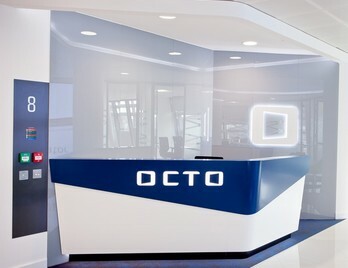 Bespoke Reception desks support a large array of equipment from computers, scanners, printers, and telephones. 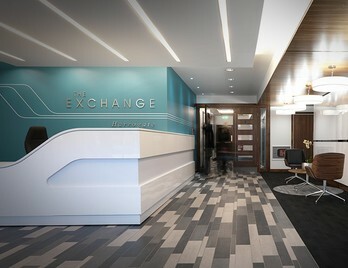 Will there be enough desk space to accommodate and will the receptionist have sufficient working area on the surface? You may need to consider how the monitor cables and other network cables will feed up from the floors or walls? Cable management may need to be incorporated under the desktops to keep the cables from trailing or interfering with legs and feet. 3. What sort of storage options need to be factored in? 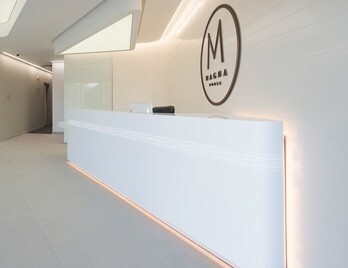 Usually, reception areas have files, documents and forms for visitors to sign. You may need to consider if you need easy access to files (pigeon holes within the countertops) or if some files need to be securely locked away by using under desk lockable pedestals or cabinets? 4. The Disability Discriminatory Act (DDA). This Act passed in 2005 gives disabled people important rights of access to everyday services. This means that reasonable provision must be made for access to buildings and within the building. 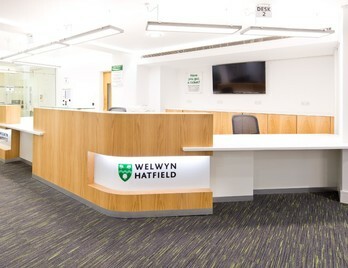 When considering a bespoke reception desk, it should be easily accessible for a wheelchair or disable people. This is usually achieved by having a low section in the middle or to the side of the desk, with a recess allowing a wheelchair user to sit comfortably under the desktop. 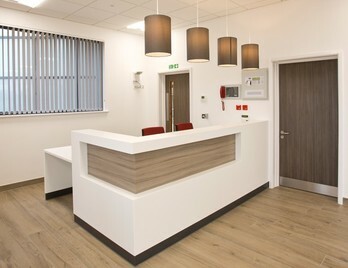 Many ‘off the shelf’ and stocked reception desks are made from MFC which stands for ‘melamine faced chipboard’. The vast majority of office furniture is manufactured with this material. The industry standard thickness is 25mm thick but some budget ranges are 18mm thick. People sometimes consider this material as low grade as it was used by furniture stores in the 1980’s, but today's MFC has come on a long way. The wood grain you see on workstations (perhaps even your own) is a print of wood grain which is repeatedly printed on to a melamine film, then heat processed onto a sheet of chipboard. Veneer takes the form of a thinly sliced piece of wood (usually thinner than 3mm) which are typically glued onto core panels, usually made up of wood, particle board or medium-density fibreboard. Veneer is obtained by either ‘peeling’ the trunk of a tree by slicing large rectangular blocks of wood know as flitches. Producing veneers is fairly intensive and only the finest and rarest logs are used by the companies that produce veneer. It is this reason why veneer reception desks are more expensive than standard MFC versions. Corian is a brand of solid surface material created by DuPont and invented in 1967 by Donal Slocum. Originally conceived as a kitchen/bath material and only available in a single colour Corian is now widely used, in many colours, and specified by architects around the world for various applications. 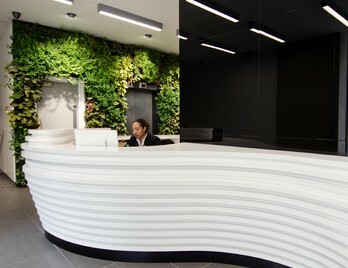 Corian is extremely durable and its smooth surface makes it easy to keep clean and to maintain. 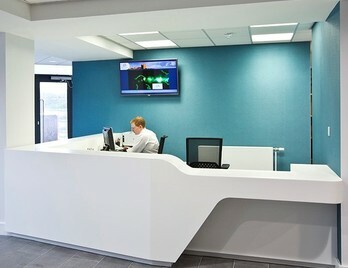 Corian is also easy to shape making it an ideal choice for bespoke reception desk requirements. Flexible when heated, Corian can be formed into many shapes, or worked like wood to give perfectly rounded edges. This gives designers the freedom to create innovative solutions for almost any design scenario. 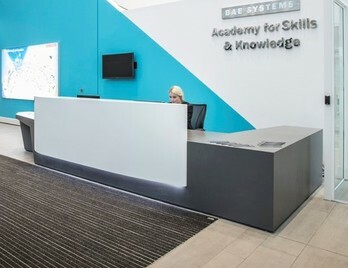 There are many other materials to choose from when considering a bespoke reception desk many manufacturers now can incorporate blocks or shelves which are glossed or lacquered and can be coloured in any RAL colour. 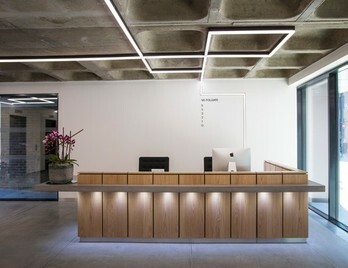 In addition to this many reception desks now incorporate LED lights which usually run the length of the plinth or the underside of the countertop, this is effective use of lighting and really sets off the overall aesthetic. If you have any doubts about specifying or using a certain material, please do not hesitate to call us as we would be happy to talk it through. 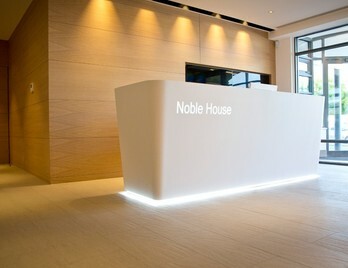 We have worked on numerous bespoke reception desks projects and work closely with bespoke reception desk manufactures. 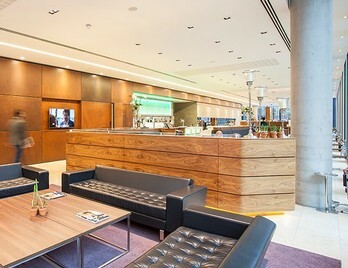 We have worked closely with a number of offices, hotels, schools, colleges, and universities in delivering bespoke reception desk and storage solutions.